Seismologists have always relied on surface observation to piece together models of what they thought Earth's interior looked like. These models served them well for years, but they were unable to map out the planet's interior with certainty, until now. A team of scientists is using the powerful US Titan supercomputer to do just that. In this view of the mantle below the Pacific, warm colors denote slower than average seismic wave speeds. Cold colors denote faster than average seismic wave speeds associated with subduction zones. Image courtesy Ebru Bozdag, University of Nice and David Pugmire, Oak Ridge National Laboratory. Not long ago, geophysicists' knowledge of the subsurface was part observation and part assumption. Seismologists sketched out the geophysical activity below their feet by reading select portions of seismic data, and developed simple tomographic models to explain what was occurring beneath the surface. These models of earthquake and volcanic activity led to the widely accepted hypotheses of plate tectonics and hotspots. These models were all based on the central assumption that the world is spherically symmetrical - that model parameters vary with depth, but not much in latitude and longitude. Nature, though, isn't quite so tidy. "Today, we've basically completely abandoned those approaches," says Jeroen Tromp, Blair professor of geology and a professor of applied and computational mathematics at Princeton University, US. "We no longer assume that there's a spherically symmetric 'background' model. We no longer assume that we're dealing with small perturbations away from that simple model. Instead, we just accept that everything is complicated, everything is three-dimensional, and we just deal with it." 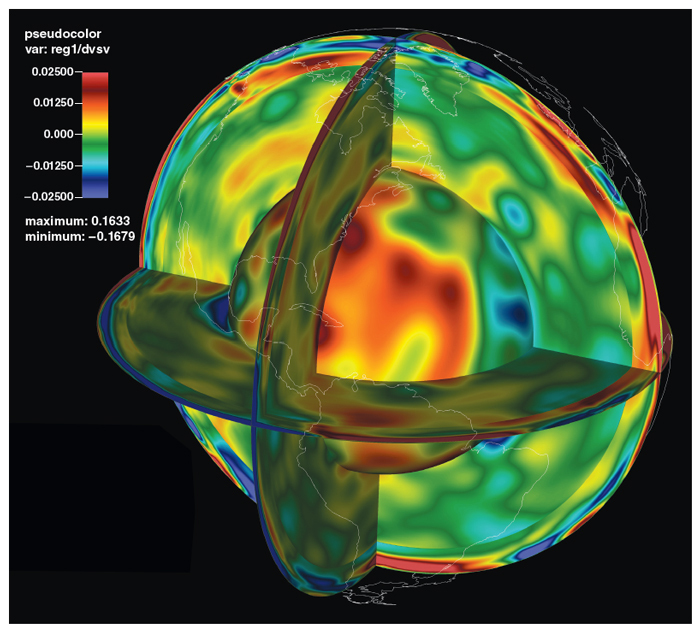 One of their ways of dealing with it is to use high-performance computing resources to create 3D models of the Earth's interior. Thanks to some serious computing muscle from the Oak Ridge Leadership Computing Facility, Tromp and his team have been able to craft new subsurface maps. To chart the new maps, Tromp and his colleagues used seismic records of hundreds of earthquakes across the world to get a picture of the Earth's interior. By determining how long it took seismic shocks to travel to stations, they identified variations in how fast the waves travel underground - and that highlighted the influence of other parameters, such as differences in temperature and composition. With 3D tomography, scientists can isolate vertical as well as horizontal slices of the mantle. Image courtesy Ebru Bozdag, University of Nice and David Pugmire, Oak Ridge National Laboratory. Using adjoint method tools, Tromp's team monitored the interaction between seismic waves as they move from the epicenter to seismometers and the 'adjoint' waves traveling back from the receivers to the source. This allows a much clearer picture of subterranean activity. But even with the reductions provided by the adjoint method, it remained a computationally intensive task, and would have been impossible without the help of the Titan supercomputer, capable of speeds over 20 teraFLOPS. 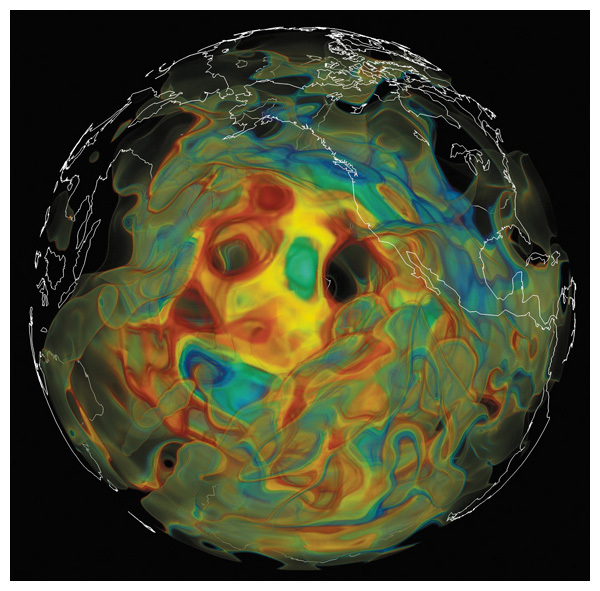 "We have to do full 3D simulations of how the waves propagate in the interior," Tromp says. "We simulate in a current model, compare that to the earthquake data, and then we use the mismatch between the simulation and the observation to improve our model. And then we repeat, so it's an iterative process." Tromp can now see hints of what geophysicists previously only surmised. Magma upwellings from deep in the Earth's mantle that rise to the surface - called plumes - are coming into sharp focus. For the first time, it's possible to see what they look like in the interior, where they start, and what their topology is. This is important for understanding their surface manifestations - places like Hawaii and Iceland - which are still in the process of being 'born' from such plumes. "It's been extremely valuable for us to be able to interact with the Oak Ridge lab and to take advantage of their expertise on these very large systems," Tromp says. "I'm very grateful for access to Titan, but also for the people who are critical to making the collaboration successful. There's absolutely no way we could have done this alone. It's the collaboration that makes this feasible." Read how earthquakes can be detected via smartphone in this week's spotlight. This movie of a March 29, 2015 magnitude 7.4 earthquake originating in Papua New Guinea was created from thousands of seismograms from hundreds of stations around the world. Simulations were performed on a Dell cluster at the Princeton Institute for Computational Science and Engineering and the San Diego Supercomputing Center Triton cluster. The oscillating colors indicate up and down wave motion. Courtesy Jeroen Tromp and Princeton University's ShakeMovie Global.